Gravity is a friend to skiers. In fact, it’s the element that makes skiing fun. To take on gravity as a friend though, you must learn how to turn on skis. This skill helps you avoid people and trees as well as control your speed — that’s the safety part. The fun part comes with carving smooth turns down a groomed corduroy slope first thing in the morning, turning shoots into heavenly in deep powdery snow. 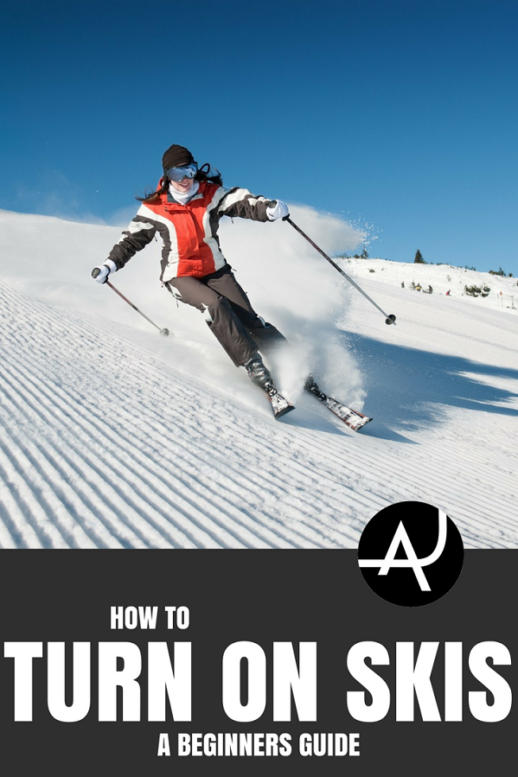 Here at The Adventure Junkies, we offer you a beginner’s guide to help you figure out how to turn on skis. Our beginner’s guide has 12 steps to guide you in learning how to turn. Once you slide on flat ground, you can go to a gentle slope to make those first turns. After mastering the basics, you can link turns and eventually sail down the slopes with confidence in your ability. Learning how to perform ski turns starts with getting fitted with the proper equipment. Ill-fitted gear inhibits turning. Rather than borrowing gear, rent an equipment package fitted especially for you. Properly fitted gear will make learning easier and safer. Ski boots are like the steering wheel of a car. If the wheel is too loose, the steering will be sloppy. Likewise, boots that are too big will make the feet feel no control over the skis. If the boots are too small, then they’ll hurt especially when pushing the foot in turns. 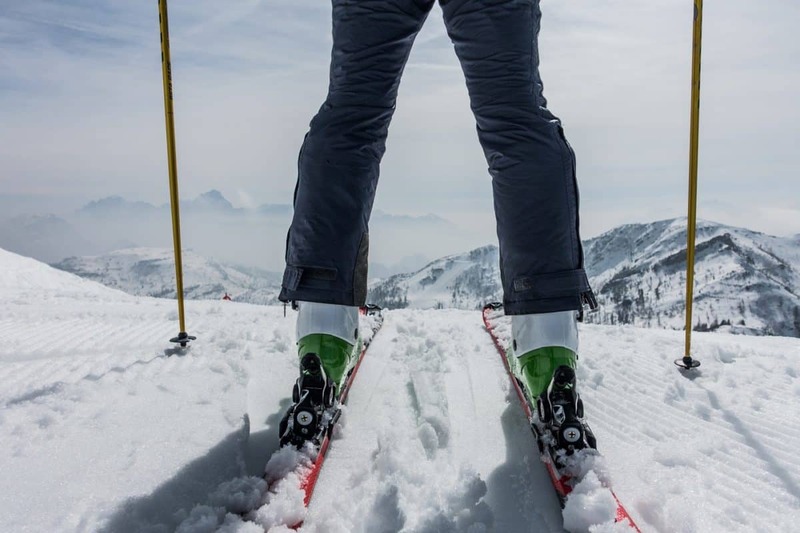 Skis need to be the correct length based on your height, weight and ability. If they are too long, turning will be a struggle. If they are too short, the arc on the ski edge won’t be able to do its job. 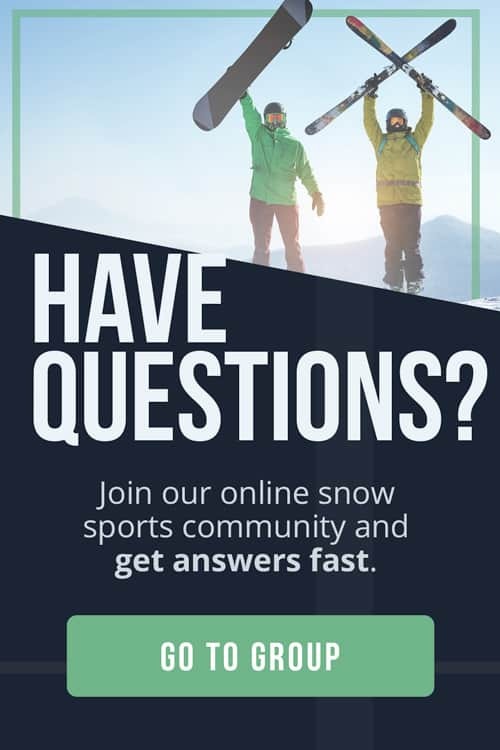 Not sure how long yours skis should be? We have a sizing guide for that. When kids learn to turn, they usually don’t use poles. However, poles give adults the assurance with the assumption of providing balance, slowing down and stopping. Actually, poles do none of these. Instead, they help with pushing across flat snow and taking off skis. Go to the pros to learn to turn. 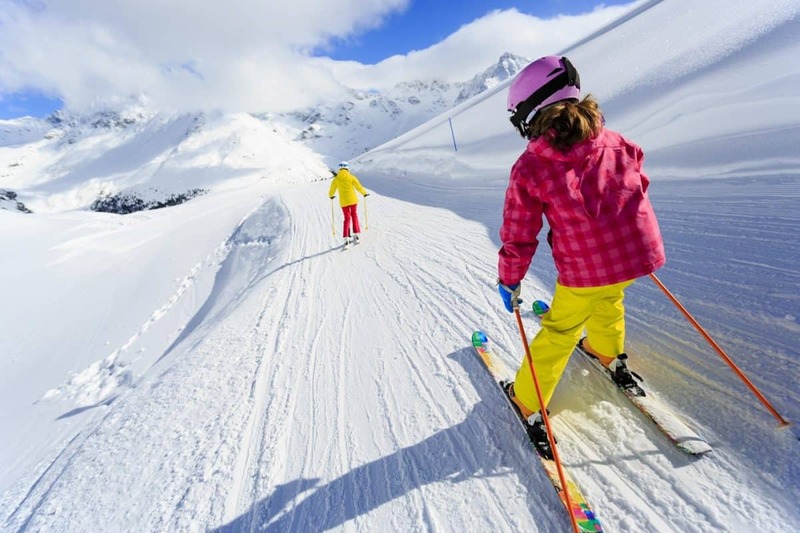 Professional ski instructors know the proper learning progression and how to master every step before of the way. In lessons from professionals, most beginner skiers learn to turn with minimal frustration in their first two hours on snow. 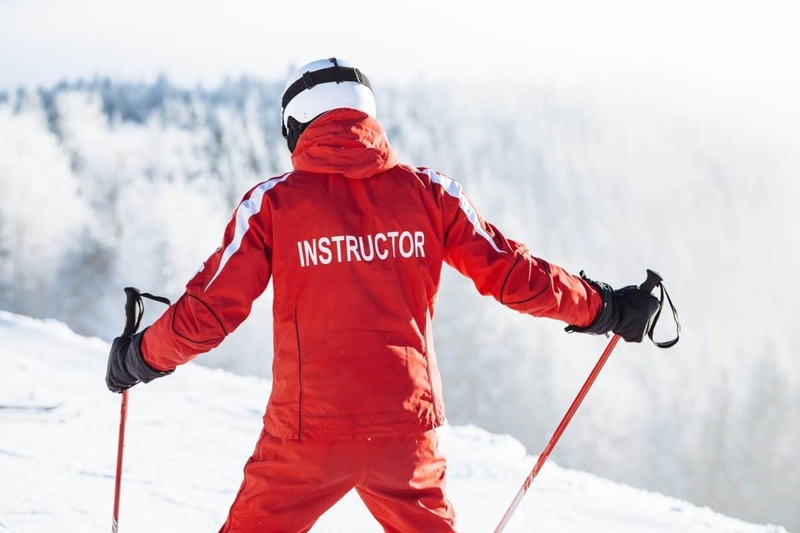 Look for ski instructors in North America who are certified through the Professional Ski Instructors of America (PSIA) or the Canadian Ski Instructors’ Alliance (CSIA). To learn to turn, group lessons are the cheaper way to go. 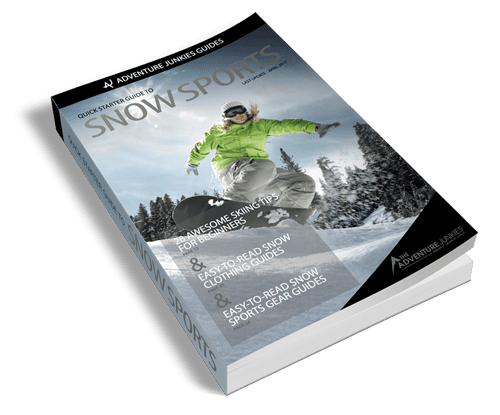 These are offered all winter long and usually come in a package that includes a lesson, lift ticket and rental gear. 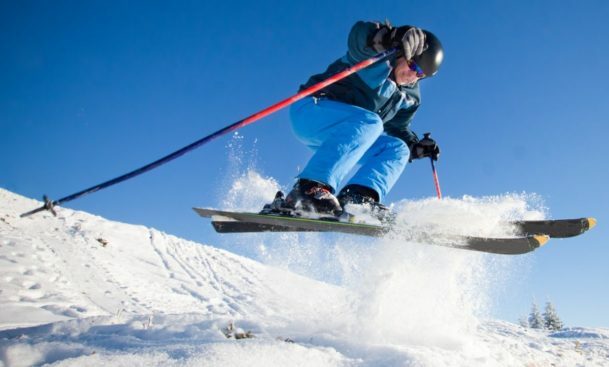 Many North American resorts package up discounted first-timer lessons, lift tickets and rentals for the January Learn to Ski and Snowboard Month. Conversely, private lessons, while more expensive, will guarantee you get all the attention as you are the only student. While most beginners start to turn in their first lesson, everyone learns at a different pace. 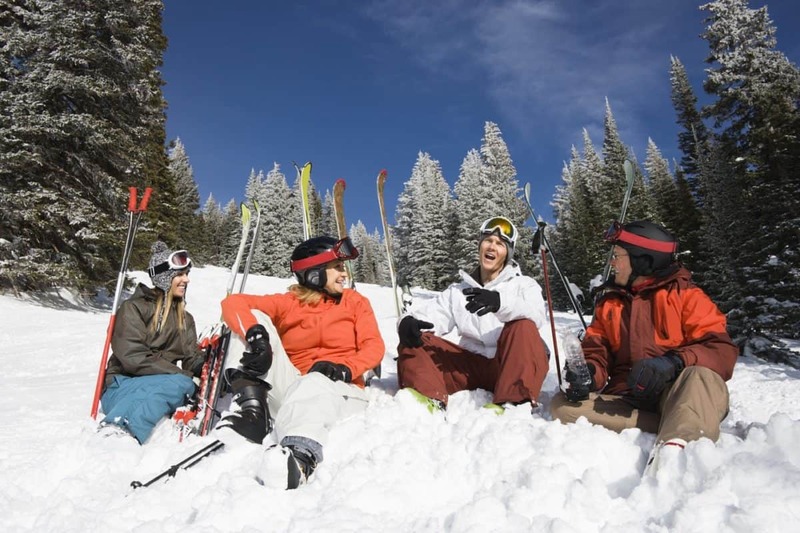 Since getting comfortable on beginner slopes usually takes about three lessons, many resorts offer three-day packages. Learning to turn starts with balancing the body over the skis in a correct stance. A proper body stance actually makes turning easier. Starting from the snow, strive to work up to create the skier alignment. For a solid base, place the feet shoulder width apart. Bend slightly in three places: ankles, knees and hips. You should look like you’re about to begin to squat. That’s the skier stance. Straightening the ankles, knees and hips results in stiff legs that cause faster tiring of quad muscles, failing to move smoothly into turning and falling. Now, distribute your body weight evenly to feel the balls and heels of your feet. Experiment with leaning forward and backward. While exerting pressure from the shin against your boot, lean forward to feel only the balls of your feet. This stance puts you too far forward. When you lean back by pressuring your calf against the boot’s back to stand only on your heels, you are going too far back. With both stances in mind, go back to the center to feel the weight evenly. That’s the posture you want to achieve. With relaxed shoulders, hold your elbows a few inches out from your body. Bend the elbows into a comfortable position with your hands forward. Stick the poles in the snow next to your boot toes. When we learn new things with our feet, we compulsively look one place— just at our feet. Unfortunately, tilting the head down to look at the feet zaps the body out of correct alignment. The rump goes back and your body weight goes to the heels. Instead of staring at your skis, hold your head up to face the direction you want to ski. Focus your eyes on your immediate destination or at least 10 feet in front of your skis to keep your full body in its proper position. Many instructors use food lingo for the basics of turning. 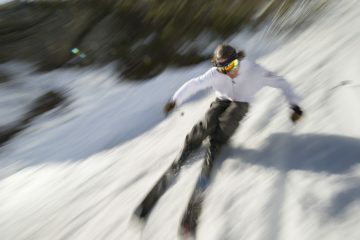 Starting on flat ground with the feet shoulder width apart, slide one ski between two positions. The French fry position puts the skis parallel, like a pair of fries lined up on a plate. From this position, slide the right ski across the snow but do not pick up the foot. While sliding, point the toes inward and push the heel out. The skis will make a “V” shape, similar to a slice of pizza. Practice sliding from French fries into the pizza using one foot and then the other. Then, try skidding both skis simultaneously from French fries into pizza. Up the ante by sliding forward while swapping positions. Go first to the beginner zone since lesser mishaps could happen with gentle slopes. Despite the minimal hill grade, standing at the top can still be scary. After all, gravity can fling you out of control straight down the hill. But on a slope, gravity makes sliding between French fries and pizza easier. Both skis can smoothly glide from fries to pizza and back again. 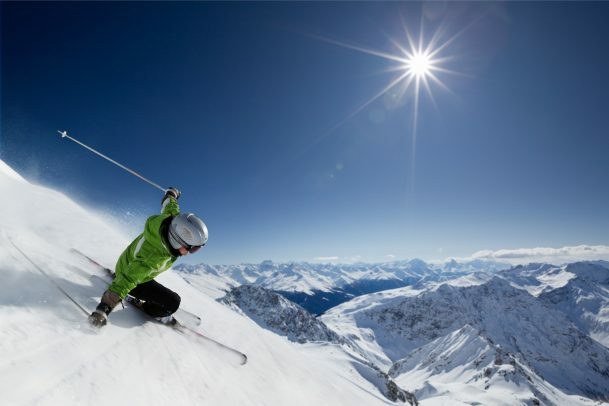 Rather than aiming straight downhill, face your body and point your skis across the slope. Let the skis run in the French fries position and then slide them into the pizza position. In the pizza stance, experiment with slowing down, controlling speed and stopping. When skiers align their skis in the French fries position, they pick up speed. Sliding the skis into the pizza shape creates resistance. That resistance slows the rate of speed. The resistance comes from keeping the tips of the skis close to each other and pressing outwards only with the heels. Pushing harder stops the skis. Releasing the pizza back into French fries resumes gliding. To experiment with controlling your speed, alter the width of the pizza. Pressing your feet harder or lighter alters the size of the pie and the amount of speed. The pizza position. Use this position for controlling speed while gliding, turning and stopping. Old school term for wedge, gliding wedge or pizza position. The French fries position. Use this position for gliding and going faster. If you place a ball on the hill, it rolls down the fall line. It’s also where the skis want to go if you don’t control their direction. Every skier has a strong or dominant side and a weaker lazy side. Turning with the dominant side will always feel better than turning on the weaker side. You may already know from hopping on one foot, running or jumping which side is dominant for you. Be prepared to feel the same lopsided strength in ski turns. To transition the wedge or snowplow into a turn, start by pushing both heels outward evenly. Then, pressure one foot more to turn your body and skis. Putting more pressure on the left foot makes the skis turn right. Weighting more on the right foot makes the skis turn left. Instead of thinking whether to go left or right, start by thinking only about the working foot—the one you push. As your wedge turns into the fall line, the working foot pushes harder on the ski. The other foot rests with less weight on it. As the resting ski turns straight down the fall line, slide it slightly forward. Continue pushing on the working ski until you face the opposite direction on the hill. Pressuring the working ski is almost like pushing a foot on a bicycle pedal. Relaxing the resting ski is comparable to letting the pedal carry the foot up. Due to the arc on the ski edges, pushing on the working ski and relaxing the resting ski naturally steers the skis around a turn. That’s the fun part. After a smooth arc, the skis face the opposite direction. Most likely, your dominant foot will execute better turns than your weaker foot. While your brain concentrates on turning the skis, sometimes the hands, arms and poles go astray from their position in front of the body. While looking forward, focus on the hands. If you can spot your hands in the periphery of your vision, then be assured that’s where they should be. With the hands forward, the body stays centered over the feet which makes for easier turning. When hands drift back behind the hips, they pull the stance out of proper alignment. The weight shifts to the heels, so the quads work overtime in a muscular wrestling match to make turns. To hold your hands in the proper place, imagine them clasping a steering wheel in front of you. When you are learning to turn, poles function as extensions of the arms. They will not be used for turning until you advance in future lessons to pole plants. Many beginnner skiers will start to link turns in their first lesson. After completing one wedge turn, you can add another wedge turn to swap directions. Repeat this until you reach the bottom of the hill. To link turns, start skiing in a wedge. Pressure the working ski and relax the resting ski to curve into the fall line. Scoot the resting ski forward while pushing on the working ski until you face the opposite direction. At this point, your former resting ski becomes the new working ski and vice versa. Slide across the hill. 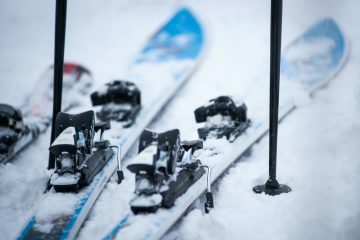 When you are ready for the next turn, pressure the new working ski and relax the new resting ski. Your skis will swing through the fall line to face the other direction across the hill. Continue to link smooth, round turns down the hill and shorten up the glide between turns. It’s okay if the skis begin to slide parallel rather than in a wedge. Remember those French fries? When turning, your skis may go naturally into a parallel position instead of a wedge. That’s okay. The eventual goal is to turn with the skis parallel. 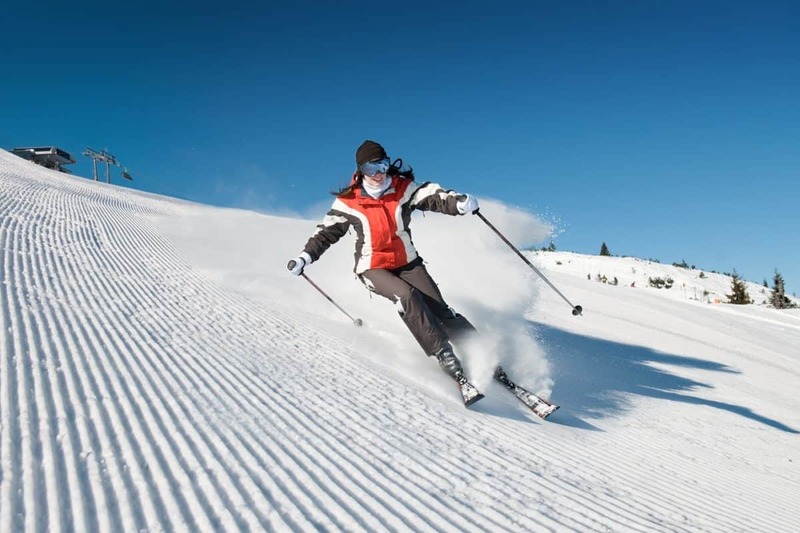 To move a wedge into parallel skiing, focus on the bottom of the turn. After turning the wedge into the fall line, let your skis slide into the parallel position around the bottom of the turn. Ride them parallel across the slope, sliding only into a wedge to slow down or start the next turn. Turning on parallel skis is the same as turning in a wedge. The movements may be subtler, and the skis will be straight rather than wedged. But, pressuring the inside edge of the working ski and relaxing the resting ski are the same. As you gain confidence and refine your technique, practice turning with skis parallel. 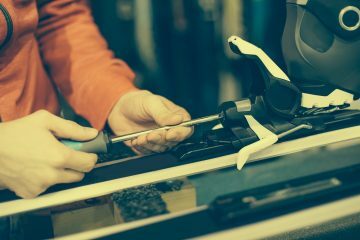 Explore changing the amount of pressure in two locations: on the shin of your boot and the inside edge of your turning ski. Using that inside edge moves the skis on to carving turns. Two things will eventually happen as you get used to more speed and steeper slopes. One is that the parallel turn becomes easier. The other is that the momentum makes you more dynamic. Dynamic parallel turns use an up and down body movement for more fluid, effective and strong arcs through the snow. Poles also establish rhythm with turns. A quick tap of the pole tip on the snow (sometimes called a pole plant) can help initiate the turn. Tap the pole for the direction you want to turn. Tap right to start a turn to the right and tap left to start a turn to the left.